Yesterday was my friend Gretchen's birthday so I decided to bake her a cake. She told me that she likes anything with chocolate or cheese in it. I didn't like the idea of an ordinary chocolate cheesecake so I started scouring through recipes until I found the Italian Love Cake. 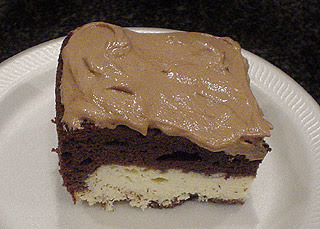 Basically it's a layer of chocolate cake topped with a layer of cheesecake before baking. The two layers switch positions in the oven so you end up with cheesecake on the bottom and chocolate on top. The final product is iced with a chocolate whipped cream. I was a little nervous at first because the cheesecake was made with ricotta cheese not cream cheese. I'm ok with this; having made ricotta cheese pie quite often, but I wasn't sure what Gretchen was going to think. So I didn't tell her until after she told me how much she liked it. She swears she couldn't tell the difference. This is easy to make and can feed a lot of people. 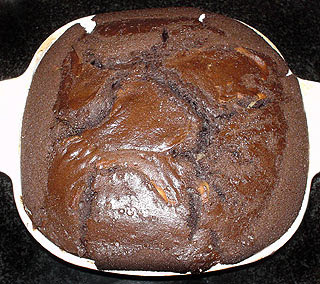 Ingredients 1 box fudge chocolate cake mix (and ingredients necessary to prepare the cake) 2 pounds ricotta cheese 1 cup sugar 4 eggs 1 teaspoon vanilla 1 box (3 3/4 oz.) instant chocolate pudding 1 cup milk 8 ounces non-dairy whipped topping, thawed Directions Preheat oven to 350°F. Prepare cake batter as directed on box and pour into greased and floured 9 x 13 pan. In separate bowl, combine ricotta, sugar, eggs, and vanilla; mix well. Spoon over unbaked cake batter. Bake for 1 hour. Cool completely. 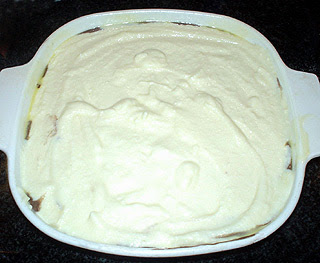 To make icing, mix instant pudding with milk; fold in whipped topping. Spread over cake, and refrigerate until ready to serve. What a great idea to use cake mix and ricotta. Never thought of that.